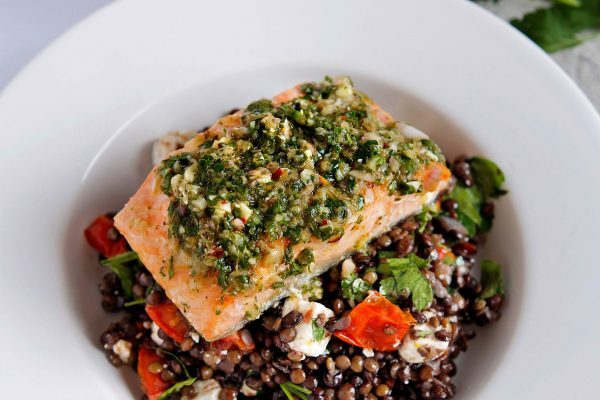 This recipe is a favourite of one of our chef’s. It also has a couple of twists along the way, but on the whole it's a traditional New England seafood chowder. 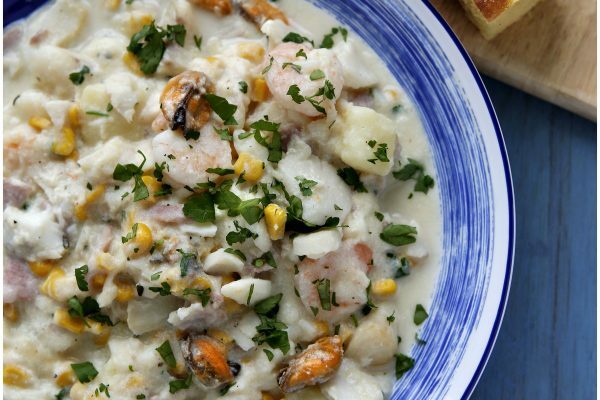 Like most recipes you find, particularly for classic dishes, the recipes will differ along the way, depending on where you look, this recipe is no different, but basically New England chowder is a chunky, creamy soup full of seafood and potatoes. You can make it with all clams to become a clam chowder but most will use a mixture of seafood like I’m doing today. In my top tip below I’ll show you how to make a fantastic accompaniment for your chowder, another real taste of America. I’ll show you how to make fantastic corn bread which when served warm with butter makes the most amazing garnish for a bowl of New England seafood chowder. 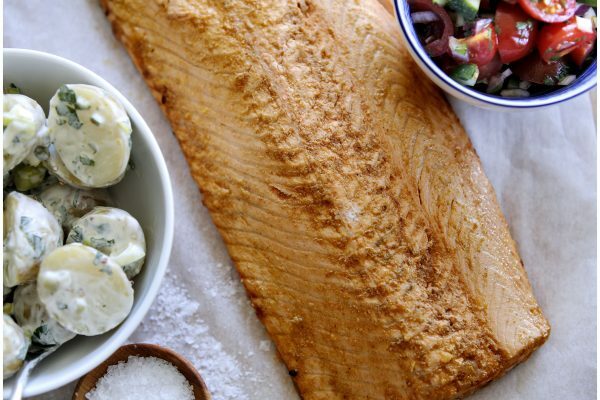 Place the smoked haddock in a pan with the bay leaf and shallot and cover with the milk. Bring to a simmer for a few minutes, then take off the heat and leave in the milk to finish cooking. In a large pan, gently fry the onions, thyme and bacon in the butter until softened. Stir in the garlic, potato and sweetcorn. Lift the haddock out of the milk with a slotted spoon, place on a plate then tear into pieces. Strain the milk through a sieve into the onion, bacon and potato mixture and simmer for about 20 minutes. Add the cooked haddock, sliced scallops, mussels, white fish and the prawns and warm through for a few minutes then stir in the parsley and season with black pepper. The perfect accompaniment for this chowder is some corn bread served warm from the oven and slathered in butter. To make this is really easy!! Mix together the following ingredients in a large bowl, 375g plain flour, 225g cornmeal, 1 tsp salt, 4 tsp baking powder, 110g sugar, 480ml blue milk, 2 free-range eggs, 110g melted butter and a small tin of sweetcorn. Now butter a baking tray or dish and pour the mixture in, bake at 199c for about 20-25 minutes then remove, allow to cool slightly and cut in to large chunks before buttering and serving with the soup. Delicious! This recipe will really perk up your lunch box!! Something that has made an appearance in all the major supermarkets over the last year or 2 is fishcakes, but not your run of the mill fishcakes, fishcakes with a soft, melting centre. Our guess is that the first person to come up with them and take them to the supermarkets, got the idea from a chocolate fondant. 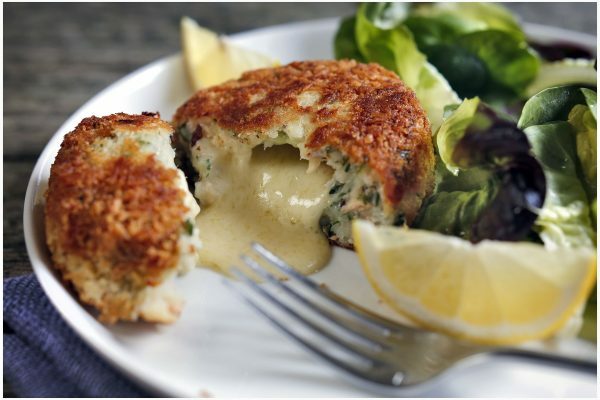 This fishcake is almost like a savory version of a chocolate fondant, where the fondant has warm chocolate sauce in the centre surrounded by chocolate sponge, our fishcake has gooey, melting cheese middle surrounded by a delicious mix of fish and potato. Sundays are almost certainly everyone's favourite day for a roast, it's tradition really isn't it? Next time you're thinking of cooking a Sunday roast, whether it be today or next week, why not think a little outside the box and try this fantastic alternative to a traditional Sunday roast?